Thank you for your patience throughout the closures of the ramps that connect I-84 and I-5. The two-week closures are complete and we now have closures that will occur on nights and weekends. We have worked to accommodate large public events such as Race For A Cure and Portlandathon. While the new roadway is complete, there is more work to do. We are now working on testing the new joint seals on the ramps. Thank you for your ongoing patience as we continue our work on the ramps that connect I-84 and I-5. The on-ramps to I-84 westbound at NE Sandy Blvd and NE 33 Avenue will be closed during these full weekend ramp closures. Night and weekend closures of the ramps that connect I-84 at I-5 continue. The work being done extends the service life of the four ramps that connect the two interstates. Three ramps were in need of structural repair and structural resurfacing. One of the ramps only required surface repairs. An average of ​147,000 vehicles pass through the I-84 and I-5 interchange on a daily basis. The concrete ramps that carry this traffic were showing wear and tear. The work included replacing bridge joints, performing structural​ repairs and resurfacing. Without these repairs, the ramps would have needed to close to trucks or other heavy vehicles and could have eventually stopped serving all drivers. I-5-at-I-84-Fact-Sheet-19531.pdf This fact sheet provides details about the project purpose and need, project elements, traffic impacts and schedule. 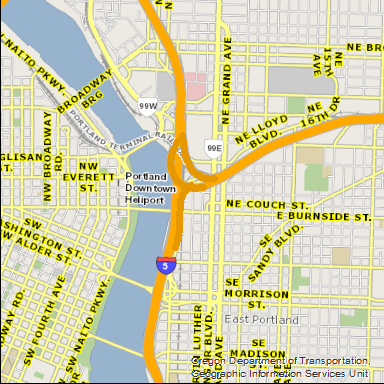 584_Detour_handouts_.pdf Detour routes for the I-84 at I-5 ramp closures in the summer of 2018.